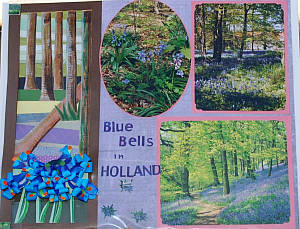 Marijke sent me a picture with handmade paper flower bluebells gracing her wonderful layout. "Bluebell - A plant of the genus Campanula, especially the Campanula rotundifolia, which bears blue bell-shaped flowers; the harebell". I love the handmade flowers on Marijke's scrapbook layout. Aren't they wonderful? But how did she make them? Let's see if I can work it out. I know Marijke would have studied the actual blooms, stamens, pistils, leaves and stems in real life before she made her flowers out of paper. That is why they look so lifelike. I think Marijke would have made the stems and leaves on her layout first since that is the first layer of the embellishment. The leaves and stems have been made with strips of different coloured cardstock and details have been marked in with photosafe markers such as Stampin' Write! markers. These would have been arranged and adhered down on her layout before Marijke positioned the flowers on top. Then I think Marijke has made the petals with small strips of paper that have been curled. She would have cut cardstock into petals shapes first and then added the details of the blooms with photo safe marking pens before curling the petals with a craft scissors or paper snips or rolling each petal around a pencil. Next I think the orange and green stamens and pistils would have been made from smaller strips of paper, again with the details marked in with the pens. They seem to be a matchstick shape. They would also have been curled and adhered to one of the petals before the entire bloom was assembled. 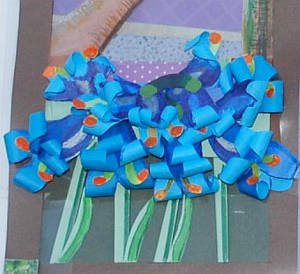 Finally the little paper flower bluebells would have been assembled in a cluster on the page and adhered down. Thank you again for sharing your lovely page with us, Marijke. I do miss scrapping with you and the other scrapping ladies in Atherton. Getting news of you with photos this way is so good. I am glad you took the time to send it to me.